At Boundstone School Lancing I was taught to play tuba by Dr King, Aedan Kearney, Peter Barrs and by top session trombone player Jack Quinn. From 1974-83: I was tuba player with the West Sussex Youth Orchestra, played with the West Sussex Youth Brass Band during this period and in 1975 was the first player to perform a solo with them, I also played tuba with the National Assosciation of Youth Orchestras Anglo-German Youth Orchestra. In 1975 I was tuba player on the SS Uganda Music Cruise Symphony Orchestra conducted by John Manduell Principal of the RNCM. After school I went to the London College of Music where I played in the Symphony Orchestra under MD Peter Turton who was also conductor of the WSYO. 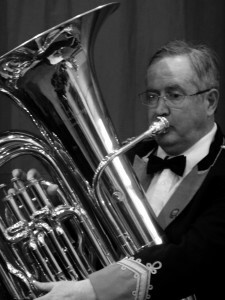 My brass career began in school when I played with the Beaufort Brass consort run by Alan Newnham. Since the mid 1980’s most of my playing has been with brass bands which i enjoy far more and find more satisfying than other mediums. The first brass band I played with was Lancing Royal British Legion who were conducted by Sqdn Ldr Norman Warnes. Norman encouraged the band to contest and at my first contest with the band we won the SCABA 2nd Section at Burgess Hill. This gave me the bug for contesting which I have had ever since. I’ve played in many bands, including: Haywards Heath, Horsham Borough and Handcross Brass with whom I played at the 2nd Section National Finals in 1987 and 1988. We were placed 2nd at the Area in 1987 winning the Area and promotion to the Championship Section in 1988. A year later the band folded but I stayed in the top section being invited to join Alder Valley Brass. This millenium I spent 8 years with Chichester City including a trip to the National Finals in the 1st Section. I then returned for a second spell with Alder Valley and a trip to the National Finals in 2010. While with Chichester I switched from Eb to BBb Bass which I now normally play. In 2013 I joined LGB Brass winning with them the title Champion Band of Great Britain 3rd Section amongst other successes. I am as happy now with this band as I have ever been playing wise. A great bunch of talented people well run and well led by MD Ian Stewart. Feel very lucky to have been to a school where I was given every opportunity to learn and develop a love for playing music. I wish every child had the opportunities I have enjoyed.